Banská Štiavnica Historic Town and Surrounding Technical Monuments UNESCO World Heritage Site was entered onto the List of the World Heritage at Cartagena (Columbia) in 1993, based on criteria (iv) and (v). Criterion (iv) means that the town and the historic technology in its environs represent a unique symbiosis of the technicised landscape and urban environment determined by the local mineral deposits and the ensuing prosperity, while criterion (v) means that the locality is a rare example of human settlement which is representative in the given culture above all if it is vulnerable due to the effects of irreversible changes connected with conclusion of the mining activity and moving of the Mining Academy. The town of Banská Štiavnica lies in the southern part of central Slovakia in the valley of the Štiavnické Mountains. The World Heritage here covers the territory of the surrounding hills and settlements dotted by artefacts of historic technologies which stand testimony to the highly developed mining activity of the past. 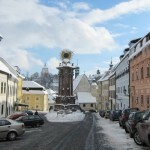 Since time immemorial Banská Štiavnica and its environs have been connected with mining and the use of noble metals like gold and especially silver. Thanks to the abundance of these metals, Banská Štiavnica was sometimes referred to as a ‘silver town’. Its coat of arms features two lizards, a golden and silver one connected by a legend narrating how the metals were discovered. Already in the 10th century a mining settlement called Bana existed on top of the local Glanzenberg Mountain (today the Old Town). 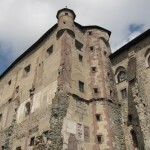 During the reign of Hungarian King Béla IV (1214-1270) Banská Štiavnica became a royal borough. It probably acquired municipal rights in 1238. The early formation of the town came about largely in accordance with the terms of the mining right which defined the conditions under which ore was extracted and underground work was carried out. Banská Štiavnica quickly became one of the most important European mining centres of the Middle Ages. However, a specific feature of this time was that mining activities blended with the residential functions of the town – this is clearly demonstrated by the fact that residential buildings were usually directly connected with the pits. This was the reason why the oldest buildings are dispersed around ore deposits. The prosperity of the town at this time was reflected in the construction of important sacral buildings (a fortified parish church, the predecessor of the Banská Štiavnica Old Castle, the Church of the Ascension of the Virgin Mary which was built on the site of the earlier three-nave Romanesque basilica, and others). Between the 13th and 15th centuries the wealth of the town obtained from ore extraction was fully manifested by the appearance of Gothic-Renaissance burgher houses, representative urban structures with extraordinary architectural features. From the mid-15th century the face of the town began to change considerably. New technological discoveries, the development of science and increased efficiency of geological explorations supported and improved the process of ore extraction. It was during this period that the Town Hall and St Katarina’s Church were built. These buildings later became the dominant features of the main square that took shape in the 16th century. By the 16th century the combined effects of Turkish raids, miners’ rebellions and religious unrest had brought stagnation and the need to fortify the town. A system of town walls was constructed to the design of Italian architect Pietro Ferrabosco. The parish church, along with the Banská Štiavnica New Castle and the Piagarská Gate, were incorporated in it. Expansion of the town did not stop. Many burgher houses were reconstructed in the style of the Italian Renaissance; the ‘knocker’ (a special bell tower for miners) was constructed. By the end of the 17th century the pits had reached such a great depth that they became flooded. By this time the cost of mining had increased to the point that consideration was even given to ceasing operations altogether. However, at this juncture builder M K Hell prepared and realised a plan to construct a system of water reservoirs, the so-called tajchy, which drained water from the flooded mines and made it possible to reopen them, at the same time using the water to drive the mining, treating and melting facilities, the hammers and the mills. The most important part of this unique technical system survived in the environs of what is today the village of Štiavnické Bane. The historic technology connected with mining and the whole technical system related to the exploitation of water energy which ensured the operation of mining mechanisms is unique in the world. The water-driven system created in the 16th century and further improved in the 18th century to make use of the hydroenergetic potential of the surrounding hills was the most advanced of its kind in the world until the 19th century. It was this system and the historic technology which it harnessed which led to the decision to include Banská Štiavnica on the List of World Heritage. The advancement of mining in the second half of the 18th century also led to significant developments in scientific education. In 1735 a mining school was opened in Banská Štiavnica and in 1762 Empress Maria Theresa decided to turn it into a Mining Academy. This Academy is considered to have been the first technological university anywhere in the world. Scientific and educational progress was accompanied by lively building activity. During the 18th century the Calvary compound was built, Holy Trinity Square was restored, and the plague pillar and Evangelical Church were constructed. During this period the town became the third largest in the Kingdom of Hungary. With the decline of mining at the turn of the 19th and 20th centuries the fame of Banská Štiavnica began to fade. Ore extraction became cost-ineffective and gradually ceased. The last mine in the Štiavnické Mountains was closed in 2001. Banská Štiavnica town and its environs as the area of the World Heritage represent a unique example of a medieval mining settlement which has survived until the present day and acquired a typical and specific form. Many scientific and technological discoveries and innovations in the area of ore processing and metallurgy took place here. The town was also the centre of mining education for many centuries. The conserved compound of technological elements and the related settlement around Banská Štiavnica provides an eloquent testimony to its significance for mining even today. 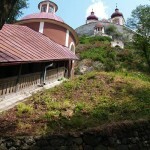 For more information about town conservation reservation Banská Štiavnica click here.